Bodyguard T280P Ortho Treadmill (2012) has a wider, sturdier treadmill with a sophisticated designed for more advanced exercisers who are looking for a balance of great feel, premium shock absorption, the latest programming including 'imagine compatibility' and excellent performance. This residential treadmill is driven by a 3.4 HP motor and has Adjustable Pivoting Feet for improved leveling on uneven floors while maximizing stability when on an incline. ToughTrain 4 out of 5 Quiet costly but have great track record. Can be a good choice. 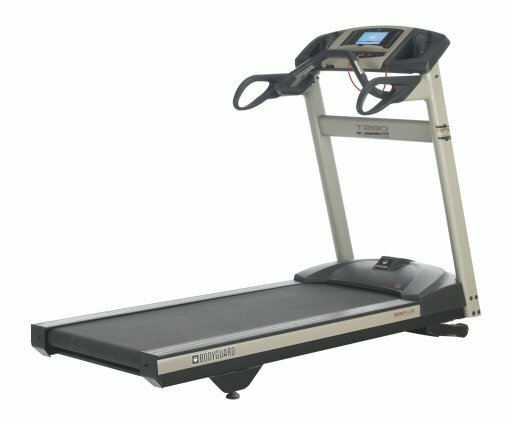 TreadmillDoctor.com 7.54 out of 10 A fine treadmill with a very good track record on service. The shortcoming of the unit simply is price but they use a big motor here. *Note: Most of the sites, stores or shopping portals listed above sell Bodyguard T280P Ortho Treadmill (2012) with discounts and other exciting offers. There is a possibility that the some of above websites are not selling Bodyguard T280P Ortho Treadmill (2012) now. Toughtrain.com is not liable for such cases or instances. Also we do not recommend any seller for Bodyguard T280P Ortho Treadmill (2012) and a buyer should buy from where he/she gets best deal with quality of products, service and on time delivery (shipment).